Turkey's president has issued a warning to Greece, Cyprus and international companies exploring for gas in the eastern Mediterranean not to "step out of line" and encroach on Turkish rights. 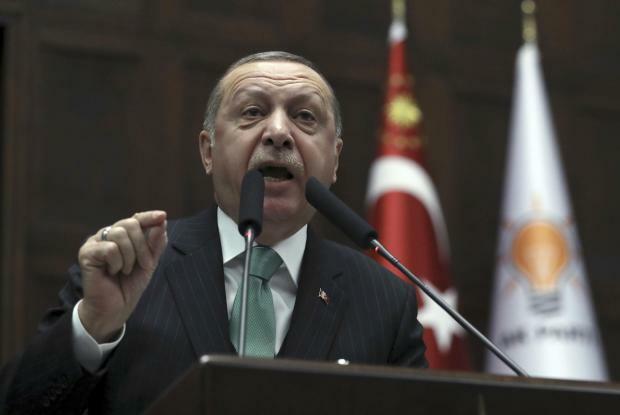 Recep Tayyip Erdogan made the warning in an address to legislators of his ruling party as Turkish warships continued to stop a rig reaching a location off Cyprus where Italian energy company Eni is scheduled to drill for gas. It came as Greek authorities said a Turkish coastguard vessel had rammed a Greek coastguard boat off a couple of uninhabited islets in the Aegean Sea over which the two Nato allies nearly went to war in 1996. Turkey opposes the gas drilling, saying it disregards the rights of breakaway Turkish Cypriots. The Cypriot government says it has a sovereign right to drill, and that if the search is successful, any income would be shared equitably if the island is reunified. The European Union on Monday cautioned Turkey to respect the territory of its member states and to avoid ratcheting up tensions. Cyprus has been divided since Turkey invaded in 1974, after a failed coup by supporters of union with Greece. The island joined the EU in 2004, but only the southern part enjoys full membership benefits. Many in Turkey also dispute Greek ownership of uninhabited Aegean islets near Turkey's coastline. "Opportunistic attempts concerning gas exploration off Cyprus and concerning Aegean islets are not escaping our attentions," Mr Erdogan said. "We are warning those who step out of line with miscalculations in Cyprus and the Aegean. Greece's coastguard said nobody was injured in the collision around midnight on Monday, although the Greek vessel suffered damage to the stern where the Turkish boat hit it with its bows. It said the precise circumstances of the incident are still unclear. The coastguard vessels were off the uninhabited Imia - Kardak in Turkish - islets, which both countries claim and are prime fishing spots, attracting boats from both countries. Greek government spokesman Dimitris Tzanakopoulos voiced concern but appealed for restraint. "Right now there is no need to pour more oil on the flames. What is needed is calm, level-headedness and a serious handling of the situation," he said. "Recently we have been seeing increasingly provocative behaviour from Turkey, which is a source of very serious concern to us," he told private Alpha radio.